bulletin and the members of "The Method Machine." since I started Method Arts or Methodicism. both points of composite art and pure art. "Method" as a brand will be succeeded. person of art for art's sake in each genre of art. Method Poem in a literary history. am The Method Poet Machine. activities of the bulletin "METHOD" after Mr. Adachi Tomomi. the most basic concept of "time" and it differs from "tempo"
effective and concrete way, which restores "discipline"
Simulation Music" is a final western music from the East. as various forms of Method Music. stoicism and discipline for its authorization. on method itself, prohibiting chance and improvisation. replaced scrupulously with other materials. itself, prohibiting personalization and absorption. alternated scrupulously with other signs. can of course forward it without adding your name. 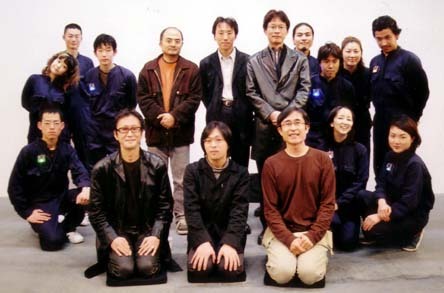 Method Machine" at SCAI THE BATHHOUSE, Tokyo on Dec 5, 2004. (The Method Machine), Tsurumi Sachiyo (The Method Machine). (The Method Machine), Suzuki Haruyuki (guest for "Method No.